The worlds first ever Step by Step how to on Drug Dealing and Robbing Banks. If you are in the Hood or the County Suburbs, you need this book. 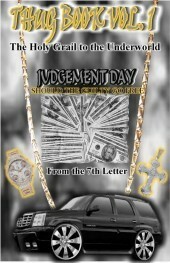 For the first time ever, a book from the most celebrated drug Kingpins of the 1990's. Fomerly Thug Book Vol 1. you learn how to go from Ounces to Bricks with ease. Rob Banks, Pimp Women and run the Game that made them Millions on the very streets your favorite Rappers talk about. A white Teenager in High School created a $40,000 a week lottery Gambling Ring off of the NFL and he shows you he did it in this very book step by step with blue prints and only $200 to start. That kid progressed his money making business to the NBA, College Football and Basketball. Anything with a point spread. He was still in High School. Also hear from Shantel J of Delaware (AKA MIMI) one of the most celebrated Hoes on Backpage.com. hear how she went to make $500,000 with her sister after reading this book. This book fits onto your smart phone as it is a word PDA. Or your computer. Its perfect. This book sold for $19.99 when it first hit the secne. Now its released updated and now for you $1.25 cents.